Creatively Sharing Easter, And a Giveaway! Back in December, I shared a creative set from FamilyLife called “What God Wants for Christmas” that really helped us be able to continuously talk about the true meaning of Christmas with Ali. And now that it’s getting close to Easter, I have a similar product by the same company to share with you: Resurrection Eggs. I’ve known about these for years because my Mom has used them in Cubbies, but I’ve never actually owned a set. But now I do, and they’re fantastic! There are twelve eggs in each carton, and a surprise in each egg. The accompanying booklet tells the story of Easter, using the items in the eggs to illustrate. I love the book’s format because the Easter story is a pretty serious story to tell a four year old, but the way that they wrote it is beautiful. It goes through the entire story, but keeps going back to the fact that Jesus didn’t HAVE to let them hurt Him, but he CHOSE to because He loves us so much. The focus is on Jesus’ love, and not just on his death. And, of course, the last egg is empty, because it signifies the empty tomb. Ali loves the eggs and each item enclosed. 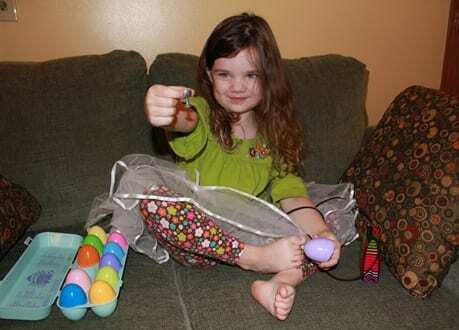 The visual cues have really helped solidify the story in her mind, and she can now narrate the entire Easter story as she opens the eggs. Ali telling me about the Last Supper, based on the Cup in the third egg. If you’d like to win one of three sets of these Resurrection Eggs, simply leave a comment on this post! If you want to purchase this set, they’re available on Family Life’s website, or you should be able to find them at your local Christian Bookstore. This giveaway will be open until Monday, March 21st. The winner will be randomly chosen and announced on Tuesday, March 22nd. Disclosure: I received a set of Resurrection Eggs for review purposes, but was not compensated for this post. My opinions are always my own. Next Post Idle Idol Observations. Previous Post The End of an Era. I have always told my girls of Jesus’ death and resurrection but these will be a wonderful way to help them understand with things they can feel and see! This is awesome! I would love to win for my son. He is at the age where he can really learn Bible stories and this would be a perfect way to teach him the story of Easter and the meaning behind it. I was just looking for some new ideas to use for Easter to share the GREAT STORY! I subscribe to your blog on my reader. I would LOVE to win one of the sets! I love resurrection eggs! We got some last year but I don’t think K was quite old enough for them b/c she didn’t really understand anything, she just played with them. But I know this year she will get it so I’m excited to do it again. So you guys are already doing it? I was planning on saving it for the 12 days before Easter, but I guess it would sink in more if we did it more. (If I win a set I will give them to my niece and nephew). These have always looked like fun, but I’ve never had a set to sit down and look through. Glad to hear you recommend them. Oh, and I follow on google reader…does that count? I’m sure my kids will understand the Easter story with this. How neat! I’ve been meaning to buy one of these sets for 3 years. This is year that I’m going to get one. If I could WIN one though, that would be the icing on the cake. I follow your blog on FB. Looks like a great product for my girls! Please enter me! I would love to do this with James. I’d love to win won of these. It would be great for when my new baby girl is a little bigger. I could also use it with AWANAS at church. We had these years ago and I loved them. I haven’t thought about them in ages! That set looks really neat, I’ll have to check itbout. Of course I’d love to win one too!! oh what awesomeness. I have never seen these, but I’d love for my kiddos to have a set! Thanks so much for making me aware of them and for the chance to win! I would love this for Ella!! What a perfect way to talk about the true meaning of Easter with your child! Thanks for such a great giveaway! My MOPS group made a homemade version a few years ago, but it isn’t holding up well! :) I would love this set for my girls! I follow you on Facebook. too! This would be wonderful for my granddaughter. That is so cool, if I don’t win, I think I’ll have to get a set of my own! These look like a great way to show kids the meaning of Easter.